This post includes affiliate links. This means that if you click on them and buy something from those websites I may receive a small commission. There is no extra cost to you, and as a bonus you’ll be sending a little appreciation my way. To learn more, see my affiliate disclosure. Thank you for your support. An email landed in my inbox last Friday morning containing such a lovely pattern that I was instantly inspired to write this post and shine the monkey beam on a new-found favourite artist. 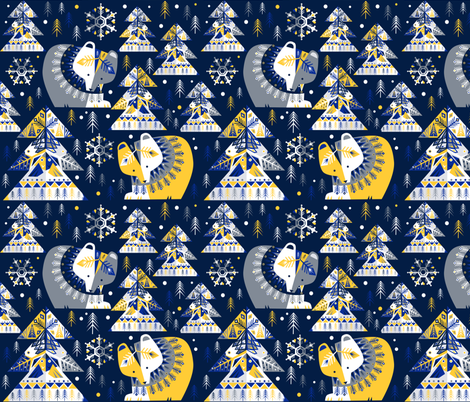 The email was from Spoonflower, announcing the winner of their recent Winter Mod Limited Color Palette Design Challenge. And the artist is Gaia Marfurt, an extremely talented Italian illustrator living in an ancient town called Belluno at the foot of the Dolomites. I’d like to be teleported there straight away. Preferably into a little taverna with a glass of Pinot Grigio and a steaming bowl of Risotto Lamonese — a regional speciality, apparently. While I wait for the teleporting machine to warm up, let’s explore some of the top ten entries in the Design Challenge. Gaia’s design incorporates several of my loves: geometric shapes, sweet animals, happy colour and a retro vibe. Don’t you just want to cuddle that bear? 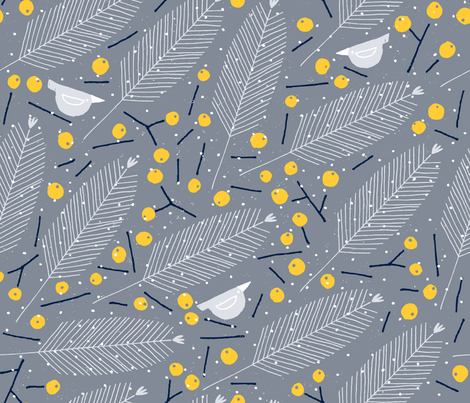 The bold colour palette of bright yellow, oxford blue, silver and cobalt was set by Spoonflower as part of the challenge and Gaia has skillfully married sophistication with playfulness in her use of these colours. Wild Wood, by mountvicandme, aka Australian designer Kara Cooper. More sweet animals! In a Winter Mod Mood, by Friztin, which really captures the mid-century modern feel. 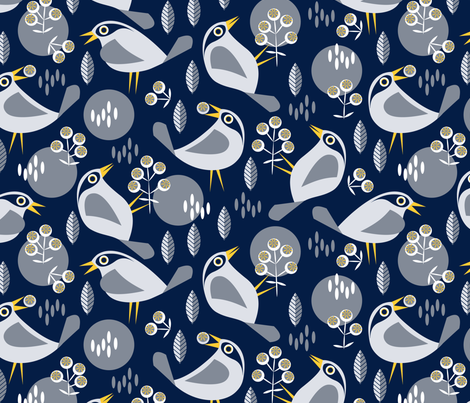 Winter Birds and Frosted Berries, by another Australian, Julie Lynch of cjldesigns. Julie’s pattern makes wonderful use of the cobalt. But back to Gaia’s work. It turns out she has a shop on RedBubble and was in fact a featured artist on their blog in April this year. If you’re not familiar with RedBubble, it’s a print-on-demand site for artists and designers. Their aim is to “give independent artists a meaningful new way to sell their creations”. Artists upload their design and select which products they’d like it to be sold on. When you purchase an item, RedBubble handles all of the printing and shipping, and the artist earns a royalty. It’s a wonderful way for artists to build up their profile and portfolio without incurring the huge costs of production. Another great thing about RedBubble is that it’s also a community, so once you’ve created a profile for yourself, you’re able to follow particular artists and stay informed when they release new designs. If you also love Gaia’s Geometric Winter design, you can buy it as a ready-made item from RedBubble on a wide range of different products, from a stylish throw pillow to a cheerful phone case. Of course, if you’re more of a DIYer, you can purchase it as fabric, wallpaper or gift wrap from Spoonflower. 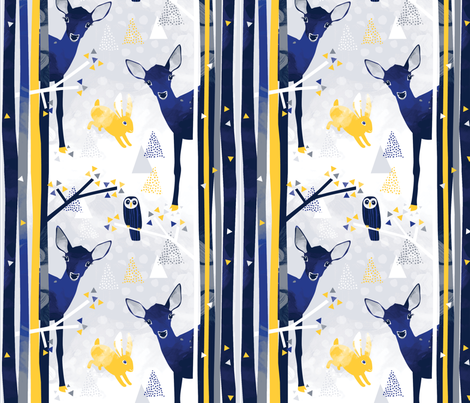 I think Geometric Winter would look very classy on Chrismas wrapping paper (if you could bear to put creases in it, that is). When you’re reading product reviews on RedBubble, do keep in mind that they are for the actual product (e.g. the throw pillow itself) not necessarily that particular designer’s artwork on the pillow. Gaia’s portfolio is extensive and diverse. I’m in awe of how she manages to produce so much beautiful work while raising four little children, as well as working on a graphic novel based on Jane Austen’s Northanger Abbey, a project inspired by her deep love of English literature and historical fiction. With Gaia’s permission, I’ve included a few more items from her RedBubble portfolio that particularly captured my fancy. As you’ll see in all of her works, her art is a happy, vibrant and richly coloured fantasy-land filled with enchanting characters. One particular element of her work that really impresses me is her skill and versatility in drawing faces and expressions. This wonderful illustration of contented, curvy yoga girls from her Inktober 2017 series offers a refreshing change to the army of skinny Instagram yogis constantly contorting their way into my feed. I’ve linked to the spiral notebook, which I think offers cheerful inspiration for any morning routine that incorporates journalling and stretches. Fat by Gaia Marfurt, part of her Inktober 2017 series. On RedBubble. I wouldn’t be a self-respecting cat-lover if I didn’t include a cat pattern, would I? Yellow damask cats is a wonderful take on a traditional style, with an unusual retro palette. Yellow Damask Cats pattern by Gaia Marfurt. On RedBubble. And I’ll finish with one of my standout favourites, Little Red Riding Hood and the Wolf, which makes a very striking art print (one I’d love to have on my wall). So much personality in these faces! Little Red Riding Hood by Gaia Marfurt. On RedBubble. You can see more of Gaia’s work on her website, her Behance profile, on Instagram as @gaiamarfurt, and in her RedBubble shop.